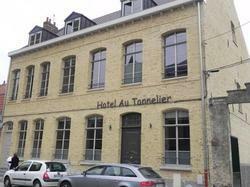 Located in Bergues, Au Tonnelier is set in an 18th-century building and is 9 km from Dunkerque. You can relax on the terrace with a drink from the bar and dine at the on-site restaurant. It is just 11 km from the beaches. With a simple, contemporary décor, all of the soundproofed rooms at Au Tonnelier feature a flat-screen TV with cable channels, a telephone and a wardrobe. Each room also includes a private bathroom with free toiletries and a bath or a shower. Buffet breakfast is served every morning in the communal lounge. The hotel's restaurant offers traditional dishes from the region for dinner. Free Wi-Fi access is available throughout the hotel. Free private parking is possible on site and Dunkerque Golf Course is 4 km from the property. Calais is 48 km away. If you plan on arriving after 19:00 from Monday to Saturday or after 17:00 on Sunday, please notify the property in advance. Contact details can be found on the booking confirmation. With a simple, contemporary décor, this soundproofed room features a flat-screen TV with cable channels, a telephone and a wardrobe. It also includes a private bathroom with free toiletries and a bath or a shower.